We feature Heil®/Airquest air conditioners, heat pumps and gas furnaces. Innovative design and proven technology provide superior performance and ultra-quiet operation that are hallmarks of Heil products. Heil furnaces provide unique solid-door construction that enhances the thermal-lined cabinet to minimize operating sounds and maximize heat retention. Solid doors and steel cabinet design provide superior strength and durability. The variable-speed circulation blower motor runs quietly and saves up to 50 percent in electricity over furnaces equipped with conventional blower motors. All Heil furnaces, heat pumps and air conditioners are renowned for being quiet, durable, efficient and service friendly. To power our heating systems, we often recommend BAXI Boilers. Over the years, the BAXI reputation has continued to grow and has become synonymous with design innovation, quality and reliability. Today, millions of people benefit from energy efficient, environmentally-friendly homes by utilizing Baxi Products. The company harnesses the latest technology and world-class manufacturing skills to build market-leading products designed to meet customers’ needs. BAXI direct-vent wall-hung boilers are non-condensing boilers with electronic flame modulation. 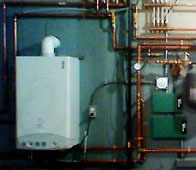 The boilers are packaged with a vent kit, circulator, expansion tank and air eliminator. BAXI Boilers are available in both natural gas or propane (LP) models. •	Clean — Radiant heat doesn't spew dust, pollutants and allergens into the air. •	Comfortable — By reaching every corner of the house, radiant heat even takes the chill out of kitchen, bathroom and lower level floors. •	Economical — Radiant heat is extremely efficient and can reduce your heatings bill dramatically. Such energy savings also benefit the environment. •	Guaranteed — When installed by the company-trained professionals at Dubben’s, the Uponor Radiant Heating System is guaranteed for 30 years. •	Practical — Uponor radiant floor heating concentrates the heat near the floor where it is most beneficial. 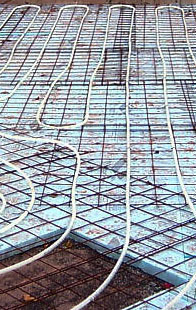 •	Versatile — Today’s radiant heating is designed to be compatible with any kind of floor covering. Uponor systems are ideal for installations in concrete slabs locations in lower levels, basements and garages. Empire Direct-Vent Wall Furnaces are another popular heating option offered at Dubben’s. Fueled by either natural gas or LP gas, the direct-vent wall furnaces do not require a chimney and are simple to install and operate. Best of all, Empire direct-vent furnaces provide total warmth for a fraction of the cost of electric heat. An optional blower is available to efficiently circulate warm air through larger spaces. 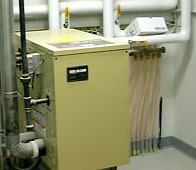 These furnaces do not require electricity for wall thermostat operation, so the heat continues even if power is lost. Empire furnaces operate cleanly and efficiently. Featuring a “matchless” piezo ignition, these furnaces include all the safety features for which Empire products are renown. These direct-vent furnaces are specifically designed for areas where flues or chimneys are not available or cannot be used. One hole through an outside wall is all that’s needed for installation of the vent apparatus. Among the rising stars in the “green revolution” are Noritz Tankless Water Heaters. Tankless water heaters provide many advantages over traditional models including the fact that users will never run out of hot water. Because a tankless water heater works on demand, there is no need to store water or to run short of hot water. Noritz systems can be designed to accommodate any size building and they provide the ideal amount of hot water for all types of uses — from small apartments to large houses. Because they only heat water when it’s needed, Noritz units are far more economical than traditional heaters, costing up to 50% percent less to operate than other water heaters. Durability is another hallmark of Noritz products. These tankless water heaters are extremely durable and last up to three times longer than traditional tank-type heaters. In addition to producing endless hot water, on demand, Noritz tankless water heaters are among the most “green” products on the market. • They use 20-30% less energy by eliminating stand-by heat loss. • Noritz water heaters operate at 83-93% efficiency which reduces carbon dioxide emissions by more than 700 pounds each year for each heater. • The main components of Noritz tankless heaters are recyclable and this equipment is dramatically smaller in size than tank heaters, thus significantly reducing landfill waste. The average tank water heater has a lifespan of 8-10 years with 7.3 million of these devices discarded into U.S. landfills annually.